Let’s kick start the year with a healthy recipe to redeem ourselves after the over indulgences of Christmas. I am definitely back on the green smoothies but struggling a bit with salads as it’s so cold. I just want a big bowl of steaming hot soup and I did say that there would be more soups recipes to come, so here you are! It took a long time but here is a delicious and filing soup/stew that is sure to warm you up and put you back on a healthy track. I know that I am very late jumping on the pumpkin wagon but I got a massive pumpkin back in October that didn’t even live to see Halloween and instead of being carved ended up roasting in my oven. It’s been patiently waiting to be used in my freezer ever since. I was planning to make a pie but I’ve been baking loads of cookies for the kids lately so I didn’t really fancy more sweet baking. Instead I made this soup, not very christmassy but delicious all the same. If you do not have pumpkin puree on hand, fear not, just replace with the same amount of passata, it works as well. 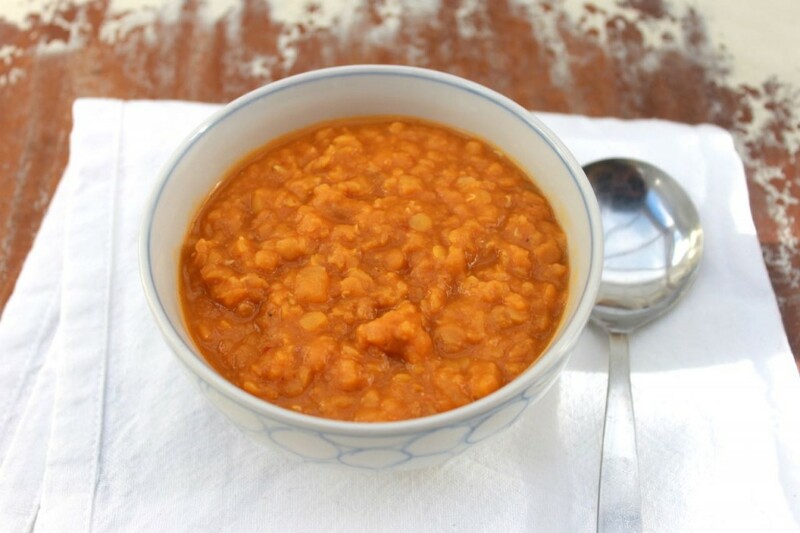 Red lentils are one of my favourite legumes. I love the texture and richness it gives to a dish. For years, I refused to go anywhere near lentils as it reminded me of school dinners (brown lentils in a kind of gravy). Little did I know that there are so many varieties of lentils, that all taste so differently. I still don’t touch brown or Puy lentils (just can’t face it), but I’ll happily eat red or yellow split lentils every day, and since they are such a good source of plant protein and iron, we should all include them in our diet. Another bonus of red lentils compared to other varieties is that they do cook faster. So you can make a super delicious and nutrition meal ready within 30 minutes, Jamie Oliver move over, we have lentils! Only kidding, I love Jamie. I always make a big batch of this soup and though it’s filling, I always come back for seconds and enjoy having it for the lunch the next day. 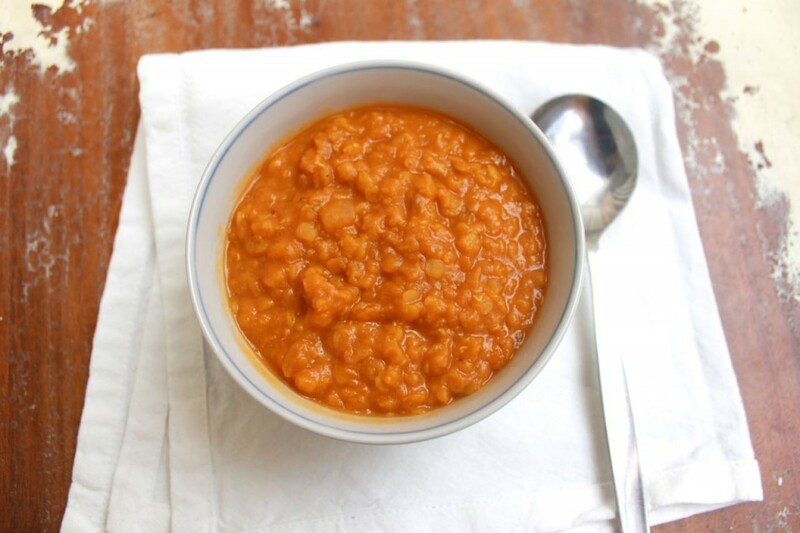 A spicy and filling soup with sweet pumpkin and nutty red lentils. If you do not have pumpkin puree, simply omit and replace with the same amount of passata sauce. Gently fry the onion in the coconut oil until soften. Add the the lentils, passata, pumpkin puree and stock and bring to a boil. Cover and lower the heat and let simmer for 25 minutes or until the lentils are cooked. Stir from time to time to make sure the bottom of the pan doesn't catch. Add the Sriracha sauce ( add more or less according to your taste buds). Serve with coriander. Taste even nicer the next day. This entry was posted in Recipes, Vegan, Vegetarian.